Minimalism – it’s an isn’t-ism. 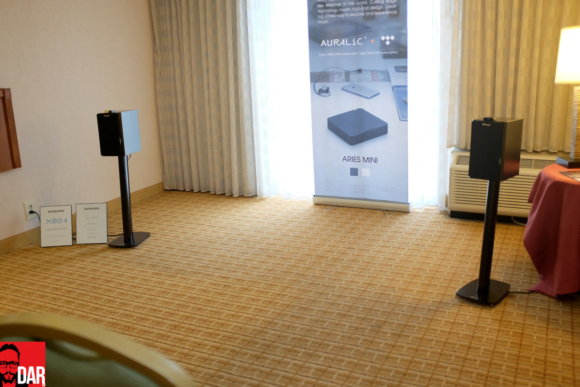 Most noticeable inside AURALiC’s Marriott hotel room was that which wasn’t: a full-size hifi rack loaded with amplifiers, power supplies, a DAC and music server. I met with AURALiC CEO Xuanqian Wang the day before RMAF kicked off and his anguished face was not the product of stress but a long hike through the Rocky Mountain National Park. “It’s easy – unpack three boxes and we are good to go!” he beamed. Those three boxes: two containing the Dynaudio Xeo 4 active loudspeakers, their stands and the Connect wifi interlink that would transmit audio from the contents of the third box: AURALiC’s soon to be released (yes, finally) Aries Mini digital audio streamer (dressed in white). 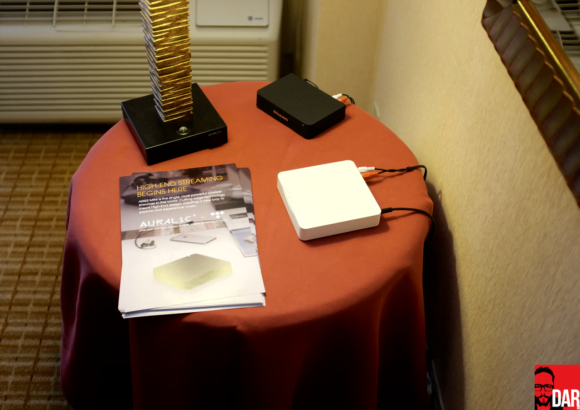 The latter two similarly-sized pieces of hardware would sit on a side table, hiding source material provider and DAC in plain sight. Clever, huh? D/A conversion came from within the Mini itself. So too did source material: one-upping its pricier forerunner still further, the Aries Mini accommodates a user-supplied internal laptop-sized HDD or SSD. AURALiC had fitted a drive inside the white Mini to: a) stream content to a second (black) Aries that could be seen firing into a pair of Audioengine A5+ as one entered the room and b) act as back up in the event that Tidal Hifi streaming refused to play ball. AURALiC had hooked the hotel room’s Ethernet cable into a router, created their own in-room LAN and streamed lossless audio from the Internet all weekend long, reportedly without any glitches. 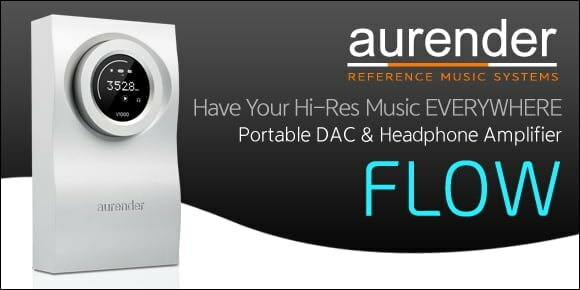 1) The Aries Mini’s price has been lifted from US$399 to US$549 – the result of accommodating sufficient dealer margin to guarantee its retail store presence (according to a confidential source and NOT AURALiC themselves). Store demos and post-purchase coverage don’t come for free. 3) The Android version of the Lightning DS app will see no further development; it’ll remain as is – functional but with questionable stability. “Android is a master of pain – too many versions,” explained a frustrated Wang. 5) Wait for the forthcoming browser-based HTML5 replacement that’ll also bring Windows and OS X into the remote control fold. 6) The iPhone remote app is still ‘coming VERY soon’. 7) The linear power supply that ships with Aries will be offered as optional extra to the Aries Mini for US$299. 8) Roon? Wang is still waiting on supply of the RoonSpeakers code. 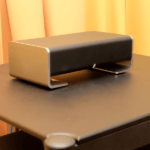 When I later met with Enno Vandermeer and Rob Darling of Roon Labs they explained how the ‘RoonSpeakers’ name was going away but the Linux OS code is almost ready to travel down Interweb wires to third party manufacturers like AURALiC. 9) On manufacturing delays, it seems that a seemingly more relaxed Wang (in Denver at least) has been tearing his hair out. The most recent of which was reportedly attributable to the Chinese government who ordered all factories closed for two weeks in observance of a national holiday. 10) The Aries Mini has already begun shipping to Europe. Australia gets theirs in October, end of, and the USA will be supplied shortly thereafter. Without all the clutter the AURALiC room was a most enjoyable place to sit, chat and listen. 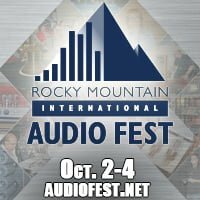 Whilst chatting with Wang, his PR dude Bryan Stanton and Audiostream’s Michael Lavorgna, I suggested that hifi’s future relevance, especially to the broader market, doesn’t only depend on price – although it helps – but also on the physical intrusion of the hardware that makes music happen. As I said, you have to use AURALiC’s app to claim/activate the Tidal sub. If you’ve already got Tidal, you could cancel and use the AURALiC supplied sub. Hmmm… Android may be more difficult, but I they are narrowing their market significantly in choosing to not develop any further for it (even if they stick to the current version). Until they reverse that decision, I’ll definitely stay clear. Actually, to tell you the truth I’m pretty much sold on the Bluesound eco-system for multi-room. The new stuff coming to Australia in November has cemented that. Would love your review thoughts on their stuff. 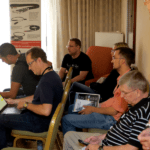 Seeing those Dyn’s, I would also really love to see an active speaker shootout one day soon! I concur. I am invested in Android, iOS (and windows). Having said that, I would like to use an app across all ecosystems at my convenience, esp if i am paying $550. I am going the Chromecast audio route. I think another advantage is that you are not restricted by the app. Some of these manufacturer apps are downright ugly. The lack of iOS is tempered by the $35! And John, we NEED a powered speaker comparison please. I hear ya, ashutoshp – patience though. These things take time. There’ll be considerably more active speaker coverage in 2016. It really amazes me that it could be so hard to develop cor Android – sonos has beautifully stable apps across ios/Android/Mac/pc – as do a number of other manufacturers…. I was really looking forward to purchasing one of these after reading about them earlier this summer and talking to the Auralic people at THE Show, having gone as far as asking my local dealer to order me one when he can, but seeing this article has scrapped those plans. Randle is spot on in his comment. Abandoning support for their android app and leaving, as the article points out, an admittedly bugging version really makes me question not only the quality of their engineers but also their commitment to their products. Second the price jump is also seems like a huge red flag. They announced this product as a certain price point to generate buzz for the product, to which Mr. Darko made certain to praise in his 5-16 article only to come to market at 40% higher. A Tidal subscription for a year does nothing offset that in my opinion. Yes, but my question is: once activated via the app, do I need to keep using the Auralic app to benefit from the free sub or can I use something else (Roon, hopefully)? You’ll need to aim that question at AURALiC. Once they get the Roon integration done I can’t see Lightning DS being long for this world. I don’t understand their logic either. I thought this was supposed to be an entry level product to help bring hi-res to average people . They’re shrinking their potential market down to nothing. I have several friends interested in hi-res. Most aren’t Apple users. How is the hi-res market going to survive when every manufacturer does everything with proprietary apps and hardware? By doing this and bundling streaming services it seems they’re all scrambling to insure their own revenue streams but doesn’t seem like it will last. They should instead, share the cost develop apps and hardware for everyone. Or better yet, open source. Unfortunately my preorder got a notice from a dealer to pay up the difference or cancel. It is not exactly 40%, but 37.6% increase over reference price. At least it is not a car for 20K with increase of 7.4K over just a few month after announcement. That’s not cool. A pre-order is a pre-order for a reason, allowing the early bird to hedge his/her bets against price rises that arrive down the line. Well, I for one am disappointed in the price increase but can understand giving dealers a greater margin and have no problem with that. As for the one year subscription to Tidal? No thank you. I refuse to support cRap and hippity-hop “music” arteests and others of their ilk, be it via paying for a service or even receiving one (as in this case) “free”. I was prepared to look into this player and if I found it worthy recommend it to friends, family and co-workers but not now. To be honest I cannot tell the difference between high-rez and what one might call “standard fare” recordings. For me, the difference is in the price. High resolution is starting to mean higher cost and I am not willing to buy the “White Album” again (MIB reference). I have several internet radios by Grace and one Squeezbox (my favorite by far for ease of use) and my Onkyo THX receiver has an internet tuner built in and they all work just fine. I am also considering the new Bose Soundtouch series for not only sound quality but ease of set up and use. As said elsewhere, if you can tell the difference then that makes the difference. For you. Whether or not you think it worth the difference in price is entirely up to you. The unit (especially in white) is aesthetically pleasing and will doubtless sound and work well so hopefully it will be a success, but again the price increase coupled with the dubious offset proffered by the one year subscription to Tidal may hamper its sales (sails?). I don’t think AURALiC missed the boat with the Aries Mini but they may have tied it to the dock. Do you not think this statement – ” I refuse to support cRap and hippity-hop “music” arteests and others of their ilk, be it via paying for a service or even receiving one (as in this case) “free”” – borders on the racist? I don’t like rap music either but there are plenty of artists that I do like, whose work streams from Tidal and who also have a financial stake in Jay Z’s service. Count me among those that have lost interest in the Aries Mini. The control app issues strike me as the sort of thing that could be a persistent PITA. The additional jamming of Tidal down customers’ throats kind of adds insult to injury. I don’t know what they’re thinking. It would seem people that have made their minds up about Tidal already have it (i.e., don’t care about it) and the people that haven’t are more likely to want to make their minds up separately from the purchase of a streamer. I’d agree with you to a large extent that audiophiles already aware of Tidal Hifi will have already signed up. But what of those who haven’t? Especially those new to the AURALiC brand sizing the Mini up against the Sonos Connect – free Tidal could be clincher. Mind you, a price hike was never gonna go down well, no matter which way you skin it. My understanding is you can use well-developed apps like J. River to stream to Aries and the Mini via UPnP? Great. My question is why would a computer audiophile buy this device when many already have dedicated CAPS or Servers. It seems like another moving (and expensive) part when plenty of devices allow long distance runs without depending on wifi – Adnaco, REGEN, Corning USB etc. I write this because I see folks using Aries with the Vega DAC and I guess they have surrendered the use of their MACs and PCs thinking playback from the NAS or local storage is the future – but haven’t they lost best part? The software. I don’t want to be stuck with Roon or an under-developed lightning app. I’ll stick with JREMOTE and JRMC.